Video of my keynote presentation at this year’s Italian Information Architecture Summit in Milan is available on the event’s website (Video | Summit Italiano di Architettura dell’Informazione). I previously posted the slides from this talk under the heading My keynote from the Italian IA Summit. Italian IA Summit, video, Design, Events, Information Architecture, Press, User Experience Comments are off for this post. 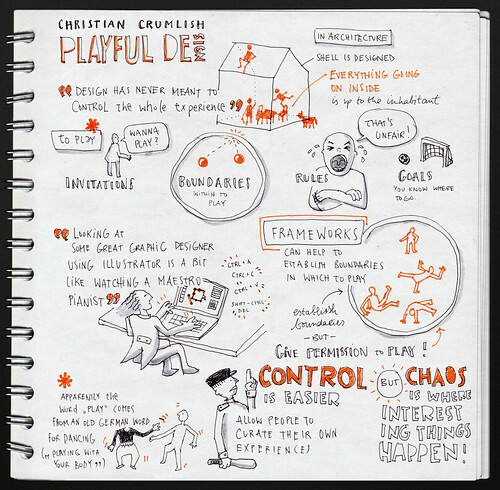 Claudia Oster took some keen notes and a posted a few great photos from the morning half of the main day at UX Lisbon this year, including a brief write-up of my talk, Playful Design, at Usability Talks. Usability Talks, Events, Press, User Experience Comments are off for this post.